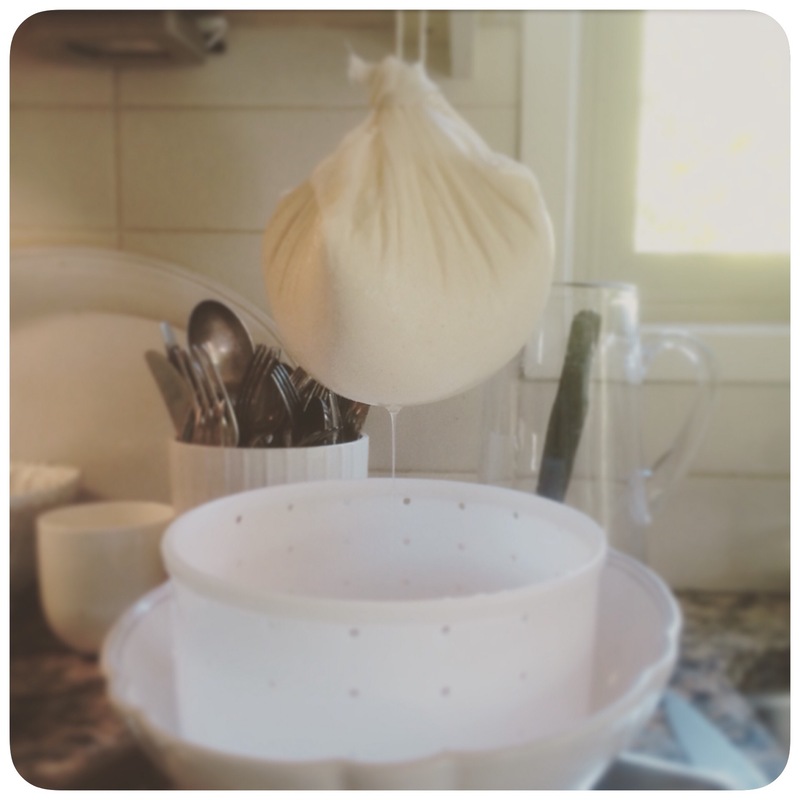 For a while now I’ve been perfecting the art of making mozzarella. It’s a fabulous party trick, that stretchy stuff, so I often make it with friends visiting the cottage. 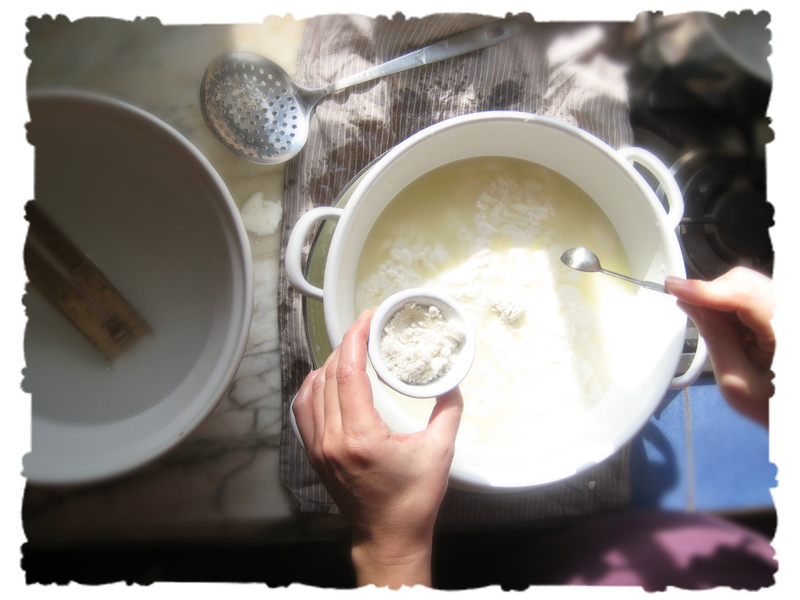 My dear Catherine, an artist and a fine brewer (with whom I have exciting brewery plans…) made mozzarella with me this weekend and we took some pictures of the happy event. 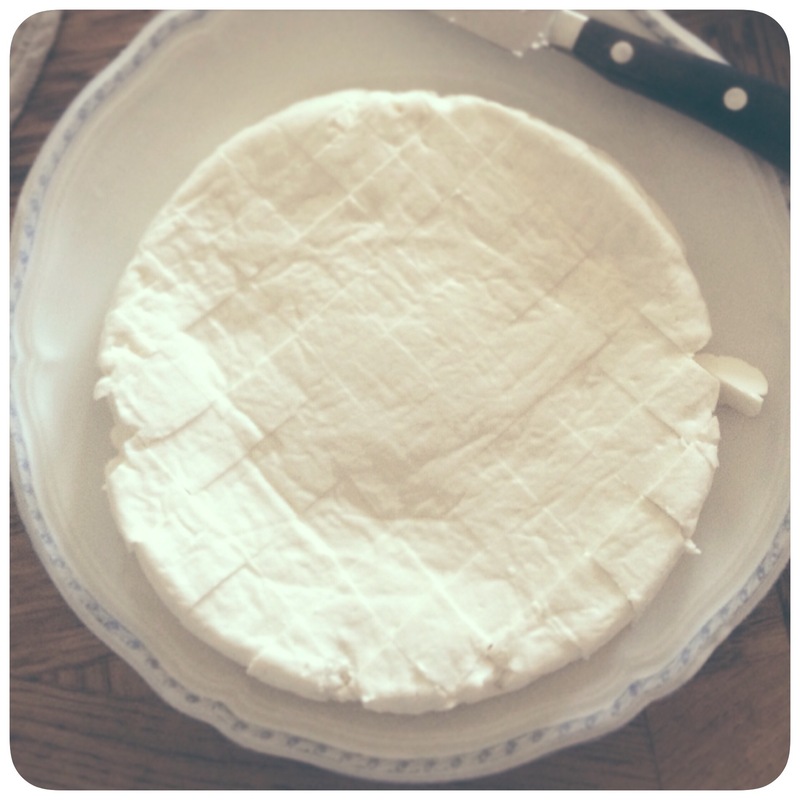 Here’s an illustrated guide, based on a brilliant recipe I’ve had great success with. 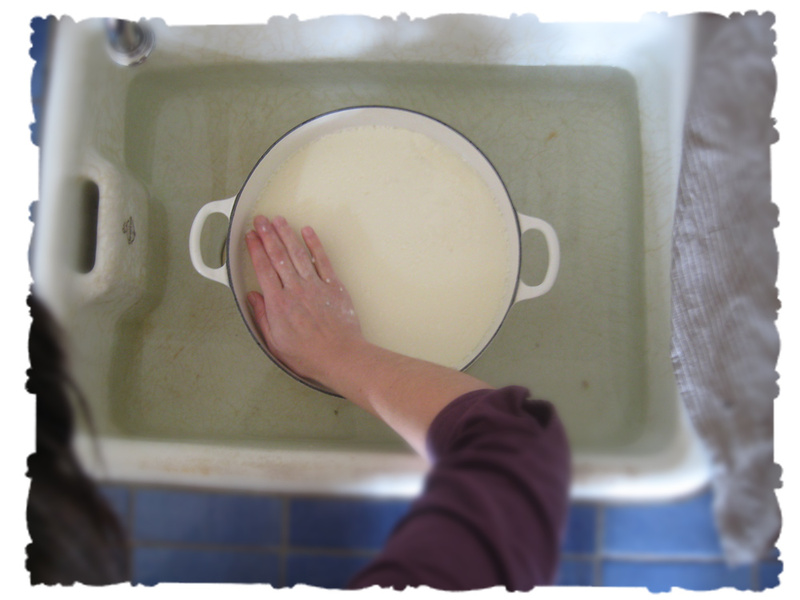 Gather the ingredients: 8 pints of fresh whole milk (we use demeter-approved organic raw whole milk from our beloved local farm), a bit of rennet, citric acid, and sea salt. 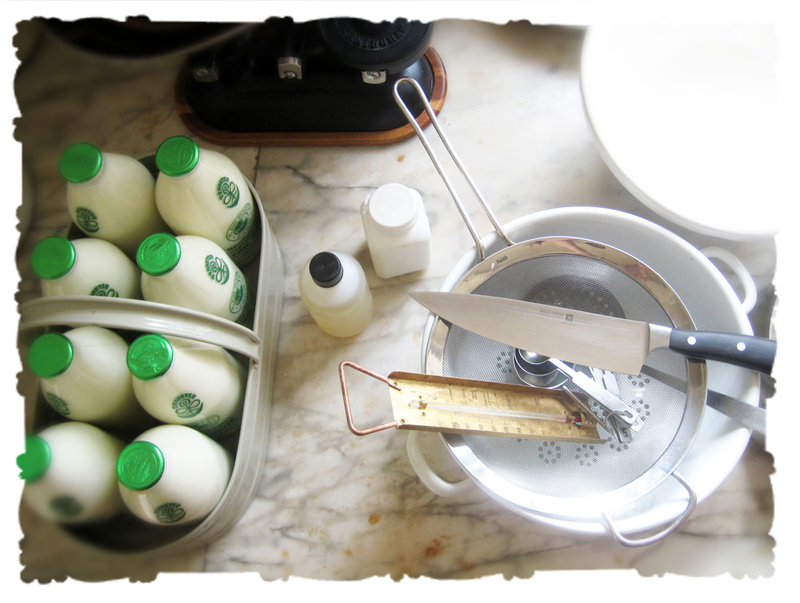 Gather the tools, sterilised, and keep them close to hand; make sure your sink is clean and has a good stopper. 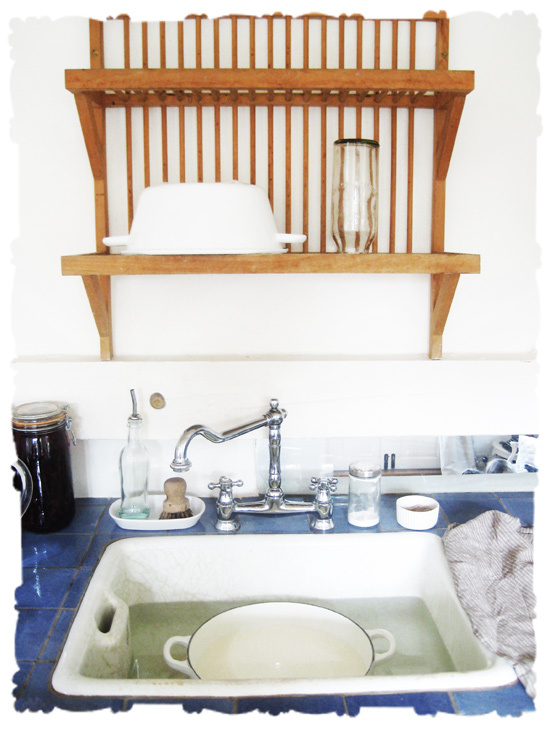 A sieve or a colander, a slotted spoon, a 2 gallon pot, measuring cups and spoons, a wooden spoon, a large heatproof bowl or pot, a long sharp knife and a cooking thermometer. Also, rubber gloves if you’re a sensitive creature and for children who want to pull the mozzarella. Ready? 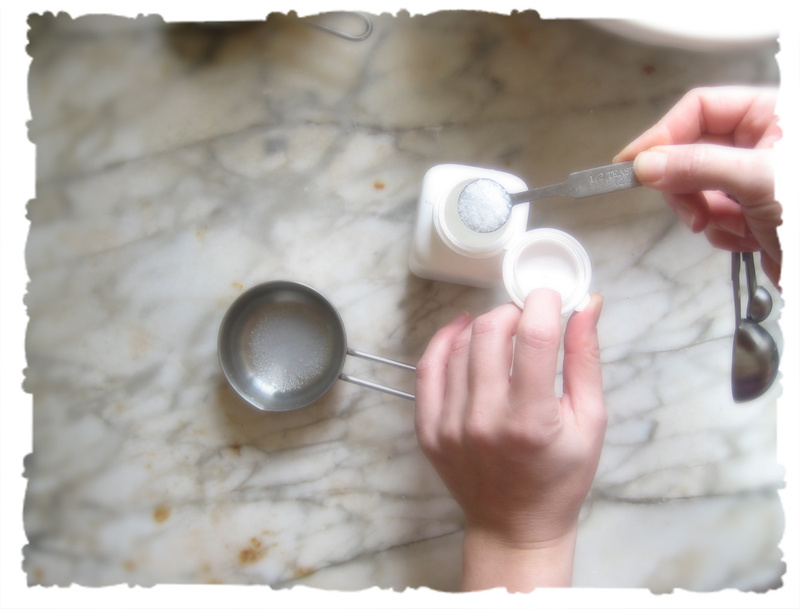 Measure a quarter teaspoon rennet (or a quarter tablet) into a quarter cup cool water, stir it well and set it aside. 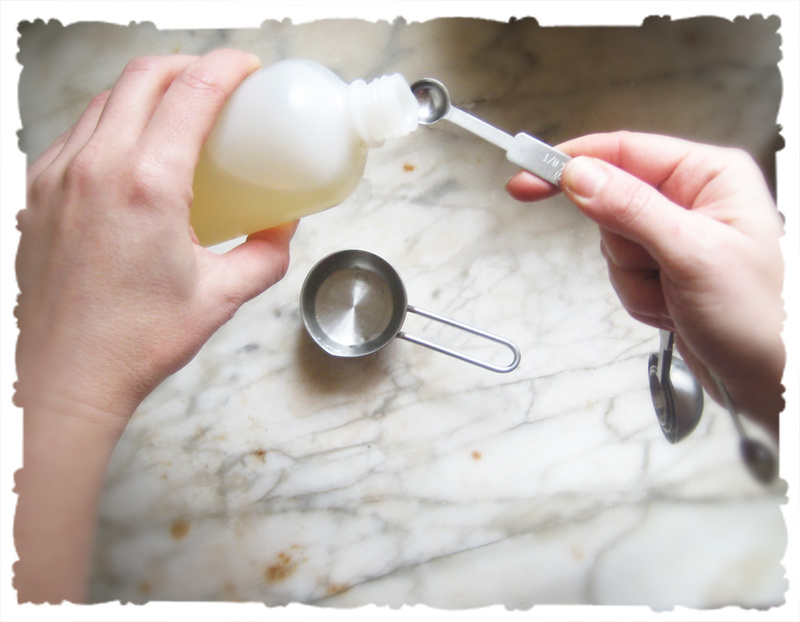 Measure 1.5 teaspoons of citric acid into half a cup cool water, and stir til dissolved. 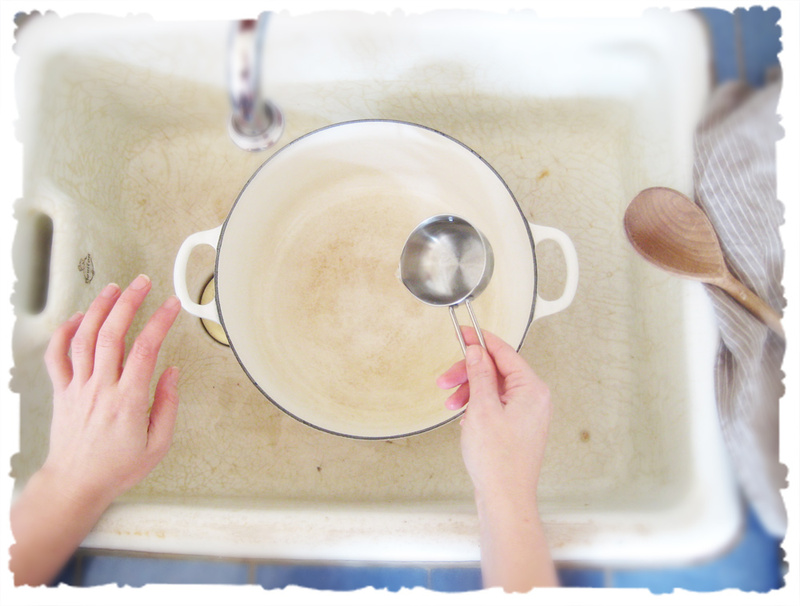 Place the large pot into the sink, and tip the citric acid solution into the pot. Stir it very well. Now the milk is acidified and we’re on our way. 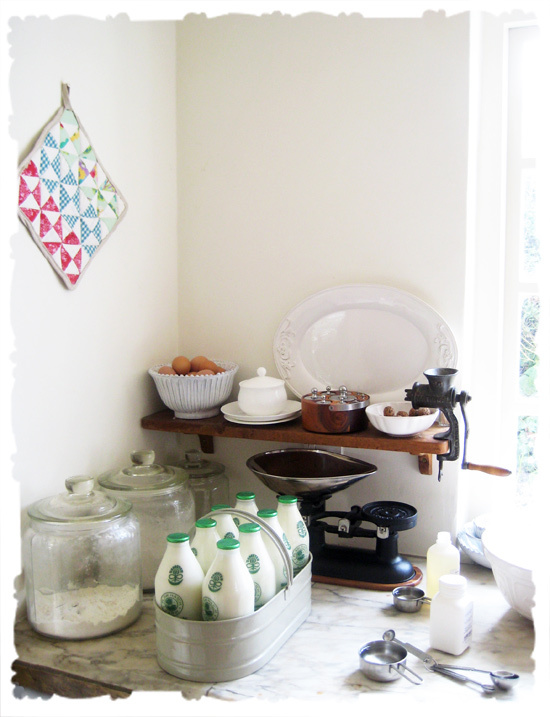 Stand the thermometer in the milk, and fill the sink, around the pot (no! not in it!) 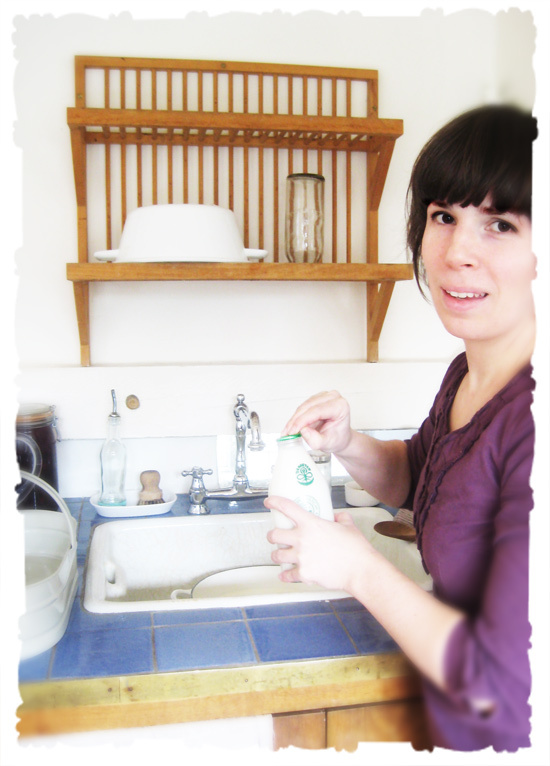 with hot water, just from the tap should do. Keep watching the thermometer, it need only go to 90 F/32 C, which isn’t very hot at all. Much like making cream cheese. 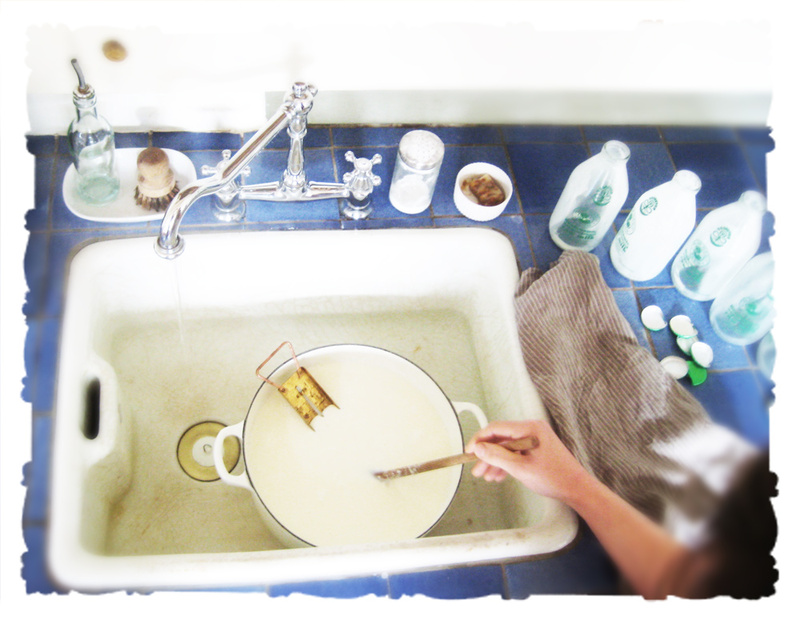 I generally fill the sink about two thirds of the way up the pot. Reached the right temperature? Now pour in the rennet solution, and stir up and down for 30 seconds. Excellent. Let the mixture stand for about five minutes. While you’re waiting, get a full kettle of water to the boil, we’re going to need it soon. Where’s your knife? 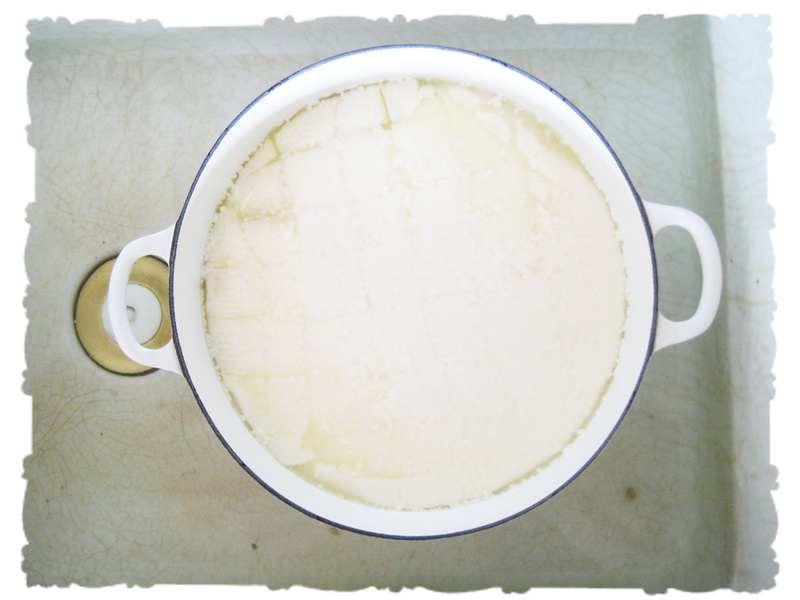 Cut the curds right to the bottom, into squares of about 1 inch. Leave it to rest another two or three minutes. Meanwhile, take your water off the boil and let it sit for a bit. 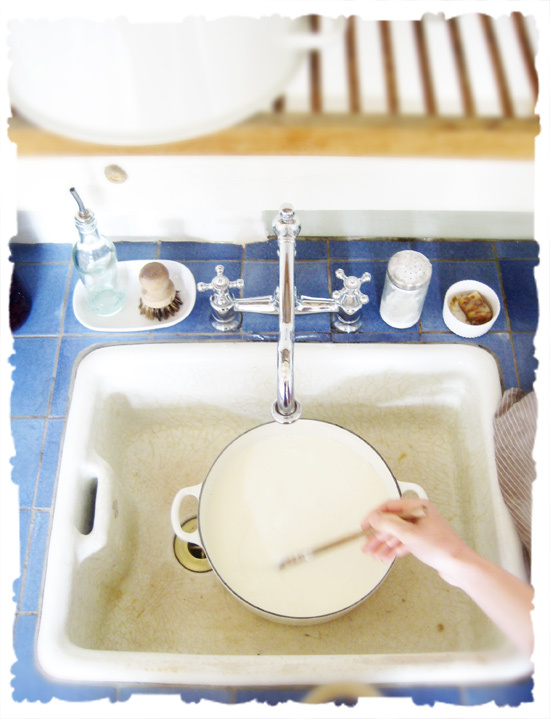 Lay a sieve or colander (I begin with the sieve, as my colander just doesn’t let much whey out) over a large bowl, next to the pot of curds and whey. 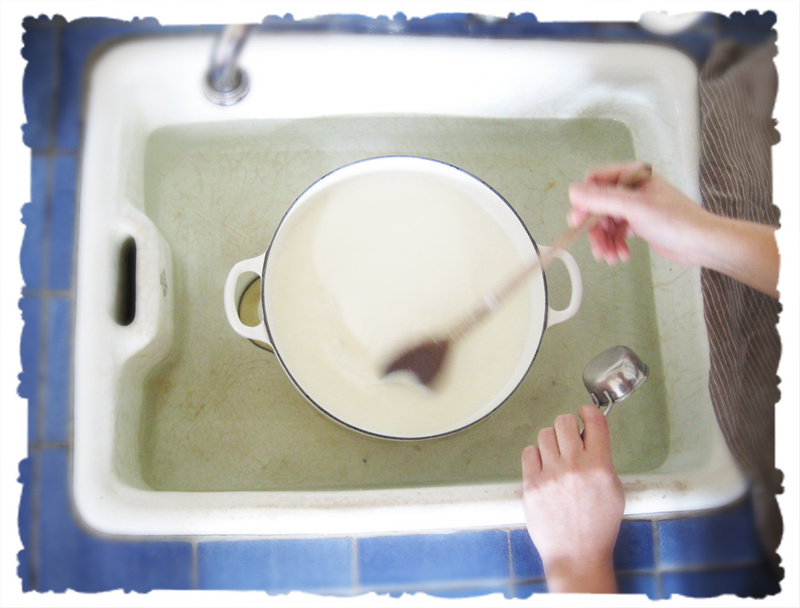 Take the slotted spoon and begin to gently lift the curds into the colander to drain. Exciting? 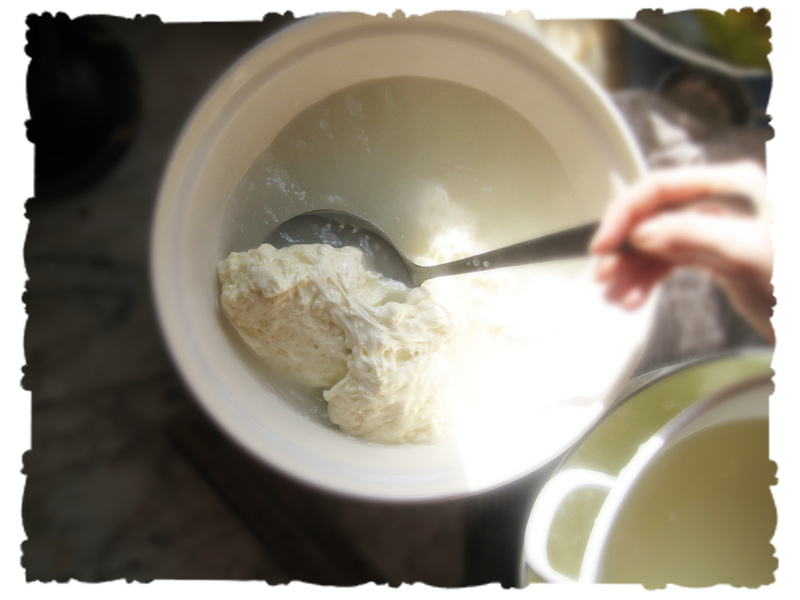 I shift curds to the colander, now over the pot, when the sieve gets too full, and tip all the whey around it. 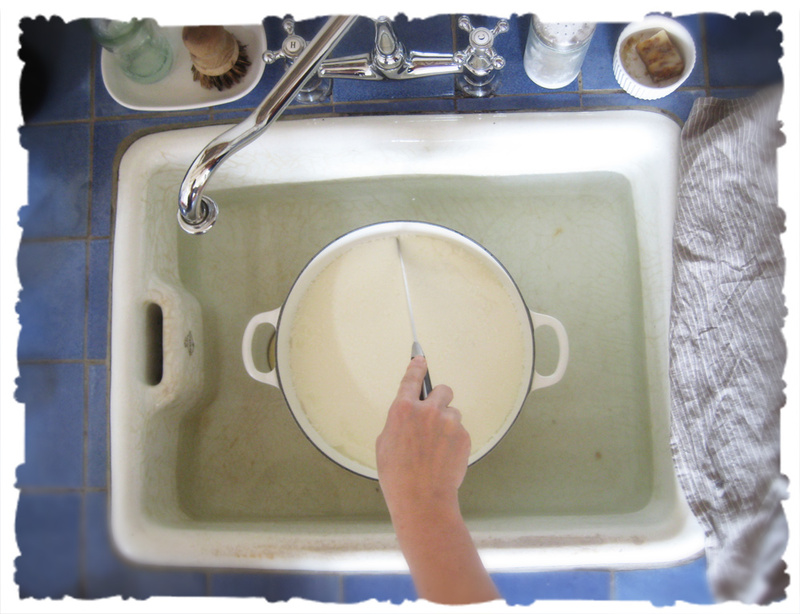 The colander will be sitting in whey to keeps the curds warm. 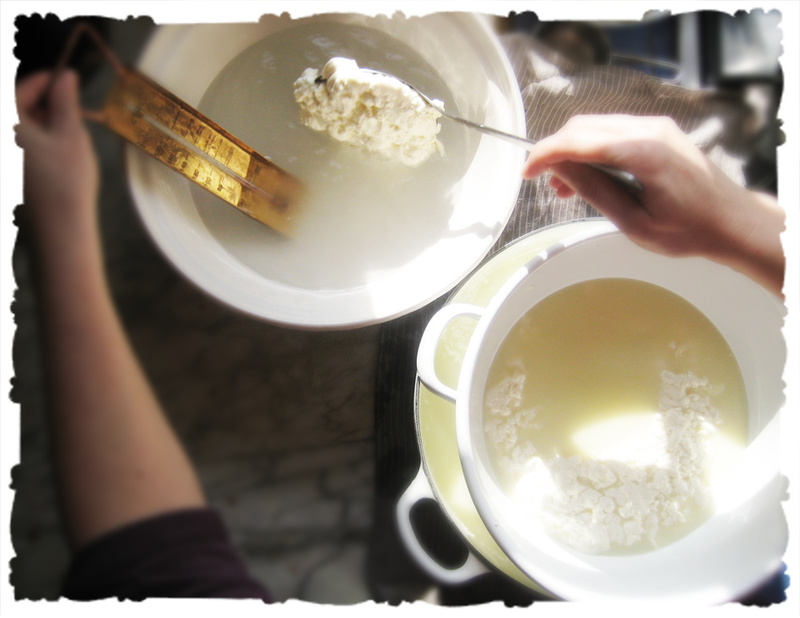 A few pinches of sea salt go in, and get worked through the curds. 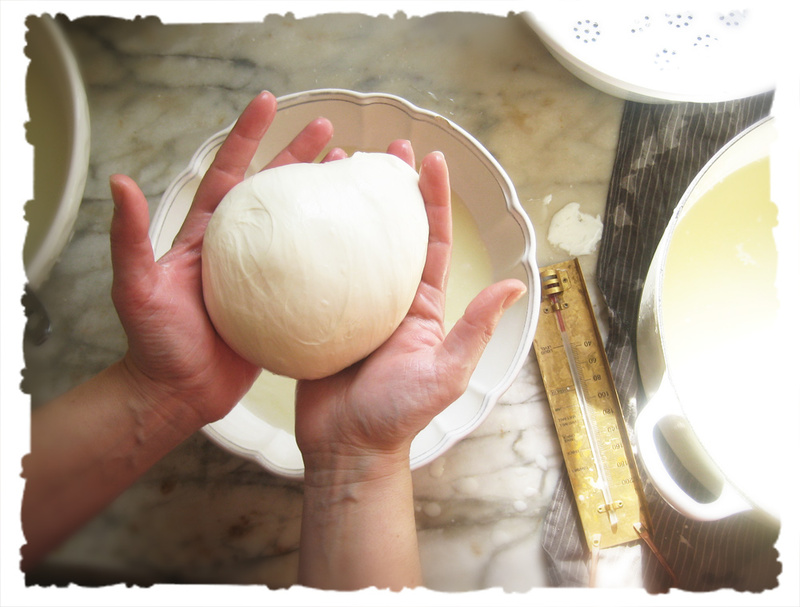 The more your work them, the dryer the final mozzarella will become. Pour most of the kettle-ful of water into a heatproof bowl or pot (I use that same bowl that caught the whey) and adjust the temperature to about 175 F/79.5C. Reserve some water in case you need it. 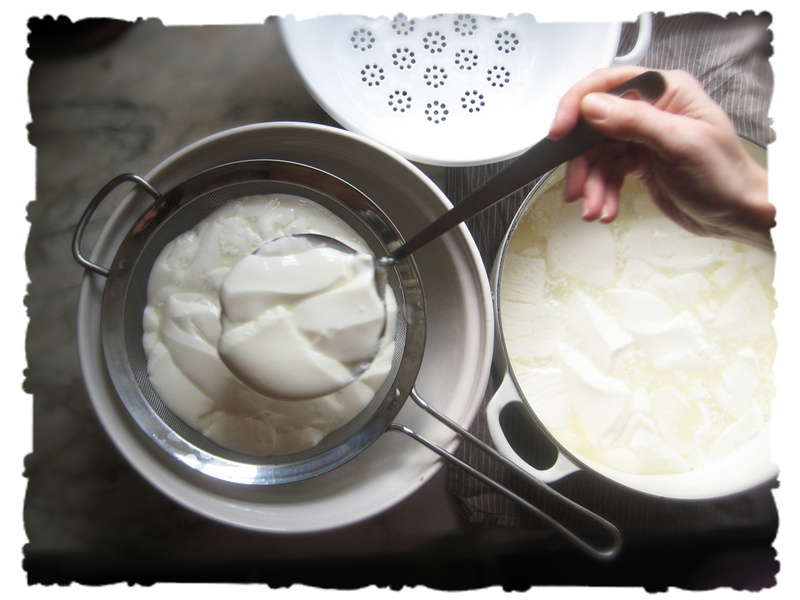 Use the slotted spoon to lift the curds into the hot water, working in two or three parts if you like. 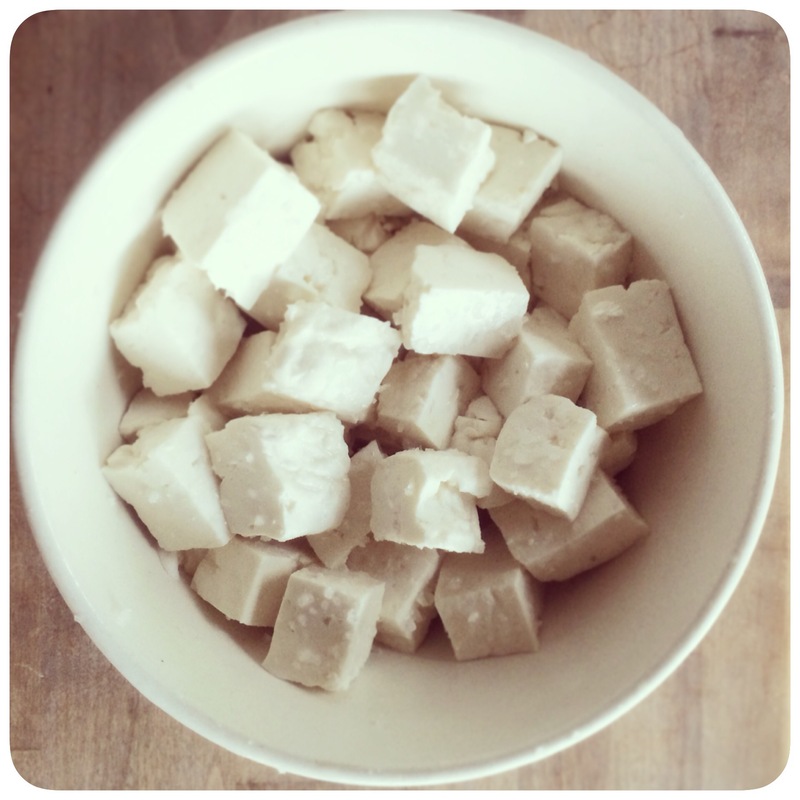 Move the curds around to help them melt into a ball. Now! 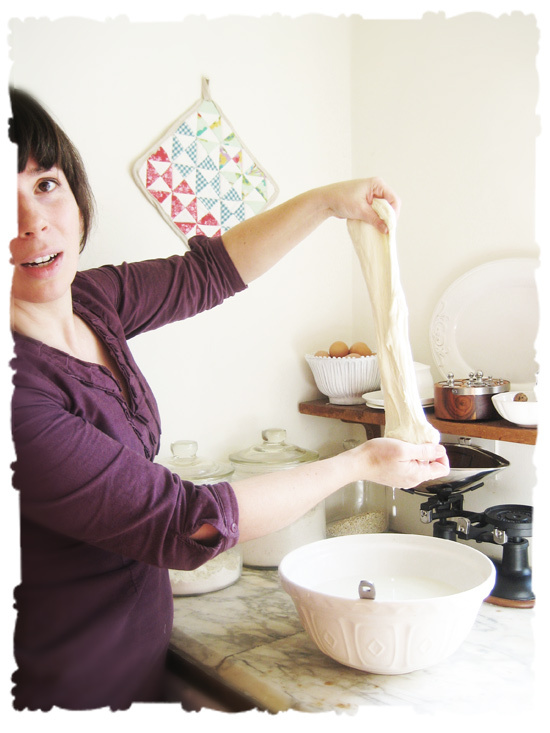 Lift it with the slotted spoon (put on your gloves if you need to!) 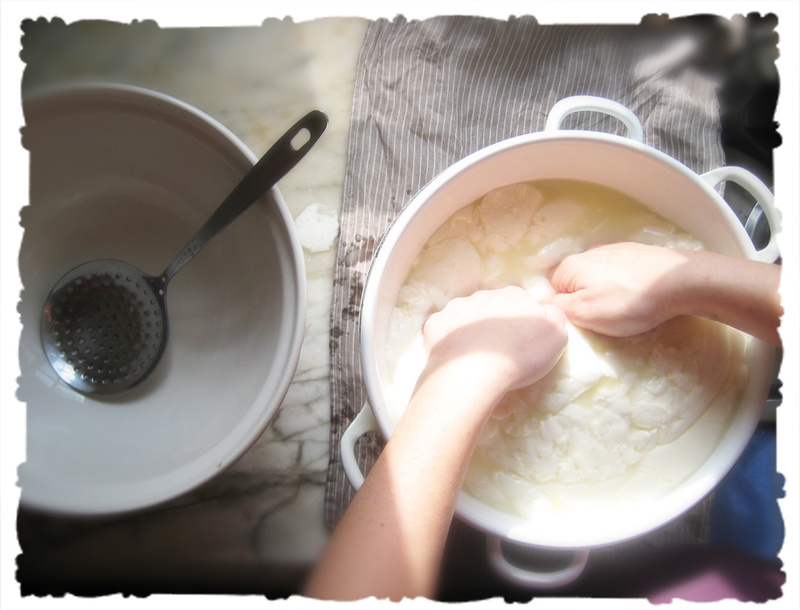 and begin to pull and fold the mozzarella! 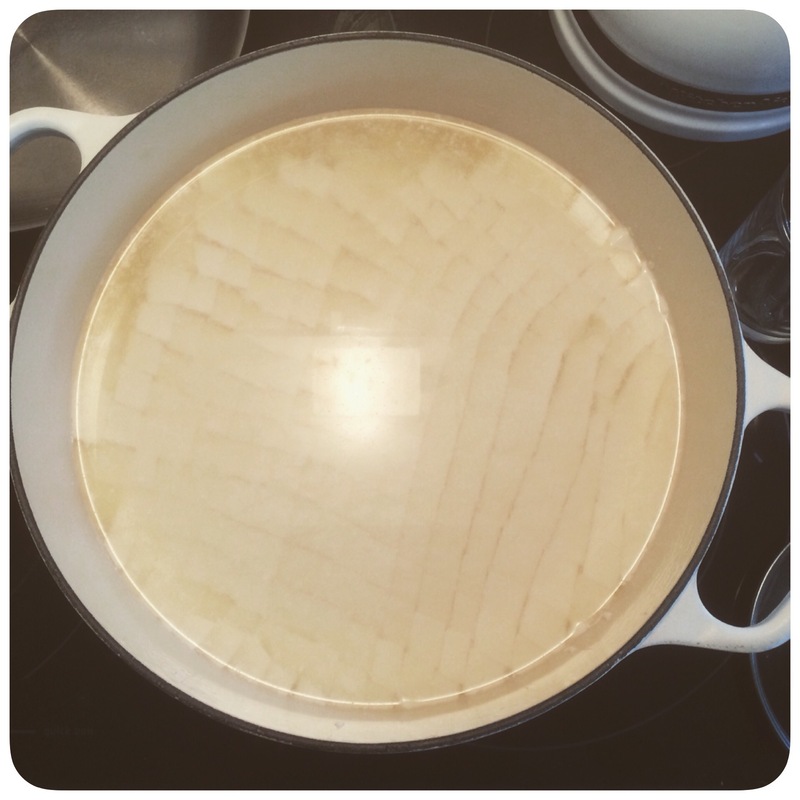 If the cheese breaks as you pull it, melt it up again in the bowl, adding hot water as needed. I love this part. Oh! 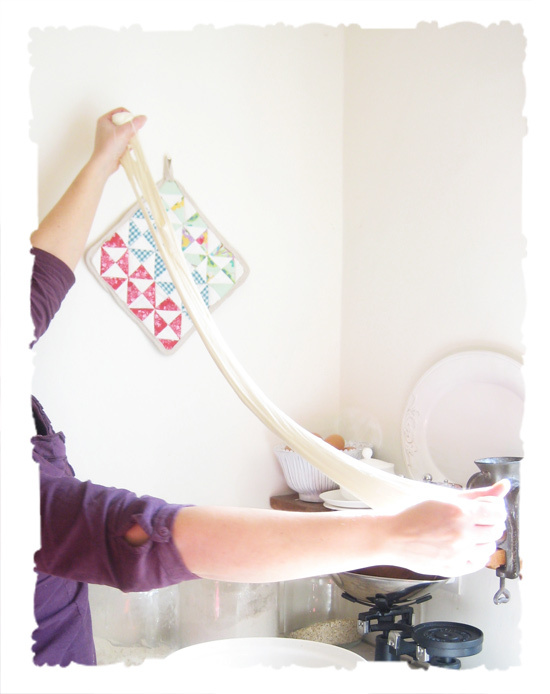 The mozzarella stretched so far, my arms weren’t long enough! It always makes me laugh. Pull it, fold it, immerse it, pull it, til a sheen like good taffy appears. Then fold it up, done! 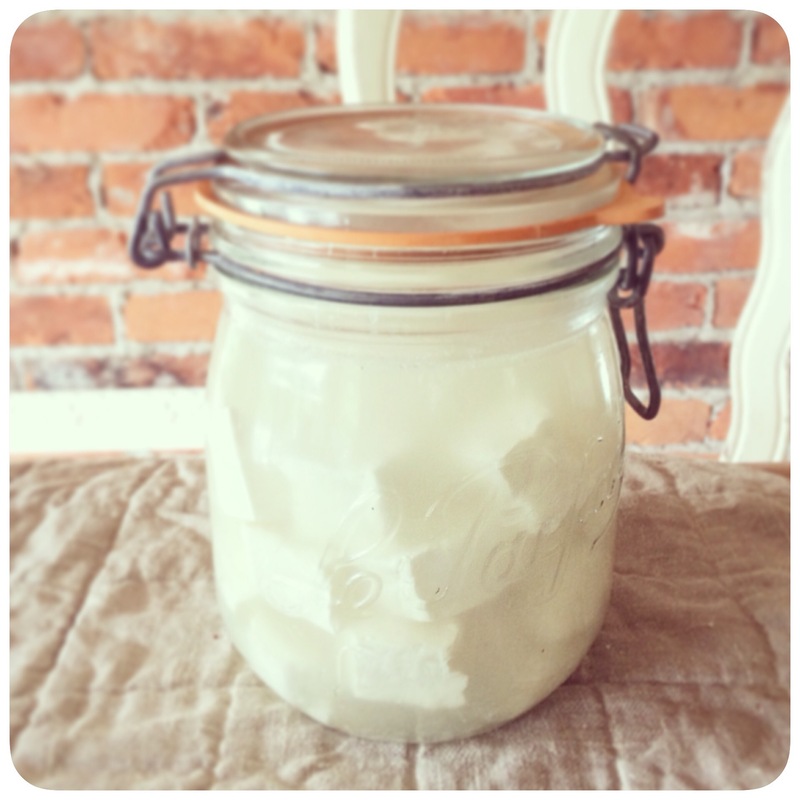 I keep our mozzarella submerged it in salted whey, chilling in the fridge, until I need it for lasagna or pizza. Soon we’ll eat it sliced with basil and tomato on fresh bread. Heaven! Do let me know if you make your own.